Virginia Right! Live Blogging From Richmond Tea Party This Evening!!! | Virginia Right! Virginia Right! will be live blogging from the Richmond Tea Party beginning mid afternoon with the setup. We will be uploading pictures and details of the event from setup until the conclusion of the event. Admission is absolutely free and the weather will be perfect for an evening with Doc Thompson’s wit and wisdom leading up to the financially savvy FoxNews guru Charles Payne. There will be a number of speakers in between on topics ranging from Federal Government Overreach to Federal Government Overreach. Well – that’s what it is all about, right? Music provided by Mean Dean, a local musician. He will be jamming with tunes like “Taking Care of Business” by Bachman Turner Overdrive and Lee Greenwood’s “Proud to be an American” DJ style beginning around 5:30 PM. The program begins around 6:30 PM and will be the most important rally Richmond has seen in, well, one year. Come and listen to the speakers as we begin the kickoff to the kick-out on November 2, 2010, the end of the line for the big spenders in Congress. It is OUR money, and they work for US! And they stopped listening. And if you are not registered to vote, stop by the Richmond Tea Party tent and WE WILL GET YOU REGISTERED! Just like Acorn, only LEGAL! 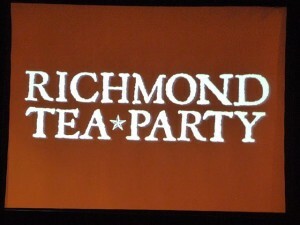 Please consider supporting the Richmond Tea Party by purchasing official Richmond Tea Party merchandise. You may do so at the Event, or by visiting the Richmond Tea Party online store. 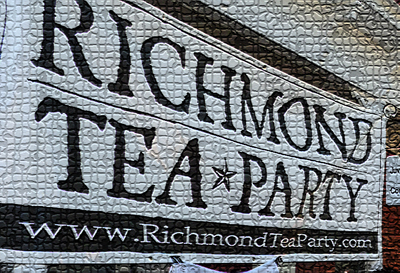 ← Richmond Tea Party Fundraiser a Smashing Success!